Do you dream of waking up rested? Have you woken up after a full nights’ sleep feeling like you haven’t recovered at all? If so, you’re not alone. Would you like to try a practice so effective at deep relaxation that every cell in your body and mind are rejuvenated? Welcome to a powerful ancient practice called Yoga Nidra. Little did I know the impact yoga nidra could have on my wellbeing and my inconsistent sleep habits. Fortunately, over the past two years, this practice has become a regular tool in my life, (I admit, I’m slightly addicted to its stress reducing benefits). To expand, the word yoga, meaning ‘union between our breath, body and mind’ relates to being conscious and connected to nature. The word nidra, on the other hand, refers to sleep. The practice of yoga nidra invites you to remain in a state of consciousness between being awake and asleep. You could refer to it as dynamic sleep – Your body rests deeply, while your mind remains fully alert. This practice effortlessly leads you into a deeply rejuvenating meditation. From a physiological perspective, your consciousness hovers in a state between your alpha and delta brainwaves. You aren’t dreaming and yet, you’re not fully awake. In this phase, your sympathetic and parasympathetic nervous system, as well as your right and left-brain functions balance. 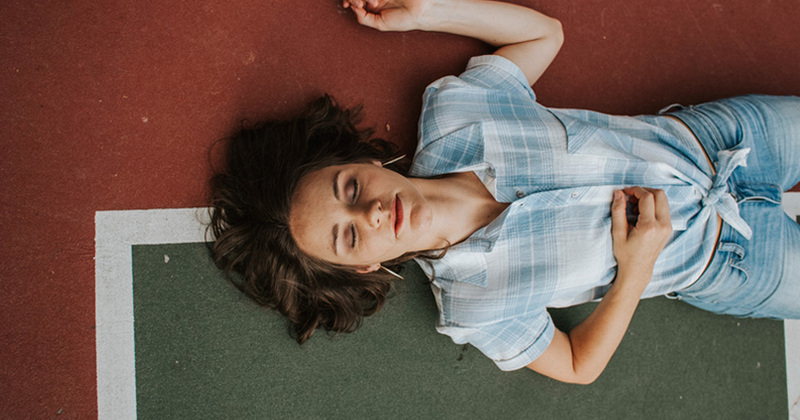 If you struggle with falling or staying asleep, yoga nidra’s ability to activate your parasympathetic nervous system provides the perfect condition for better rest during the night. As you lie in a comfortable position, the guided meditation takes you through active concentration to focus your mind. Following this phase, you drop into a more relaxed, thoughtless state. Your mind then sinks into a deeper wave state, the condition where fast learning occurs and unhealthy thought patterns can be released (similar to hypnosis). Without knowing it, you have access to changing neural pathways associated with negative behaviour. Due to our fast-paced, often stressful lives, our minds and bodies rarely receive the deep rest they require. Compounded over long periods of time, our sympathetic nervous system takes the lead and we feel uptight and tired and sleeping properly becomes a challenge. Ultimately, our health and wellbeing always relies on adequate sleep. Guided by a certified yoga nidra practitioner you begin the practice by setting a sankalpa, (there are many wonderful resources available on apps and online). Sankalpa means positive resolution. It is a short statement or intention identified at the beginning of your practice and repeated at the end. You are planting a positive seed in your subconscious mind. It must be something of immense importance to you. It can relate to overcoming a mental or physical challenge, awakening an unrecognised strength, gaining clarity on a life question, or simply, to find deeper internal balance. Focus on the positive when creating your statement. Instead of saying, “I would like to give up my unhealthy exercise habits…”, you could say, “I am developing a strong and healthy body”. Once you set your sankalpa, you release it and allow the meditation practice to take over and do the work for you. This practice invites deep surrender. There is no effort required. There will be moments, like during any meditative practice when thoughts float in, if you notice them, come back to sounds and feeling your body. Return to your sankalpa at the end of the practice. Reflect on the thoughts you recall. If you don’t remember any, that’s fine too. The practice is working on a deep, subconscious level. I hope you can prioritise this profoundly healing practice to experience increased physical energy, stress relief and deeply rejuvenating sleep! Practice yoga with Lisa in our Power Living yoga studios! If you are a Manly studio yogi (or can get there), you won’t want to miss out on this Yoga Nidra special workshop facilitated by Fiona Scicluna on 20 April. Book your spot and nourish yourself through deep rest here.